The zombie Descent level is included in the final Advanced Warfare DLC pack, Reckoning. It concludes the Advanced Warfare zombie saga that's put stars Bill Paxton, Rose McGowan, Jon Bernthal, Bruce Campbell and John Malkovich through increasingly silly versions of zombie hell. In this one the zombies wear exoskeletons and can rocket boost up to your position. They have other "enhanced abilities" too, but that's unlikely to save them from the new Trident Reflected Energy Weapon, which looks like it's been beamed in straight from Unreal Tournament. In a good way. Reckoning is out today on consoles, and there will probably be the usual month-long wait for it to arrive on PC. 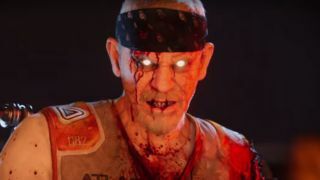 This is the final fling for Advanced Warfare, but series fans can look forward to Black Ops 3, which has its own very strange zombie mode featuring Jeff Goldblum and Ron Perlman.